“you are so special, your finger prints are unique and specific only to you. There is no one else like you. And mind you, I do not speak merely out of affection! Why are people unhappy and wanting to possess what someone else has? Fair people want to have a tanned skin and vice versa. We constantly compare ourselves with others. It is human nature to measure each one of them in comparison to others. Comparisons are not bad. If you can compare, you can compete and if you compete, you can win. The competitor’s present status and performance invigorates you. 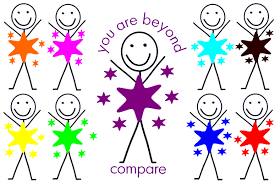 Comparisons can be used to motivate or correct you. These comparisons become a problem when they are used for all the wrong reasons like branding or making oneself superior to others or when one compares thereby eliciting a wrong response like admitting a sense of defeat etc. It is only then, that the problem arises. In these cases, they destroy the souls. Then what do we do with comparison?’ A positive benchmarking leading to positive thoughts are fine, but do not get into negative benchmarking leading to nefarious thoughts. Here is a sample for you for negative benchmarking. There was a hunter who bought an amazing bird dog. It could walk on water, and even hunt for ducks running on water. He showed the dog to his friend praising its efficiency in hunting on water. His friend did not compliment but found fault with the dog saying that this dog cannot swim, while his dog can swim. This is clearly negative benchmarking. See the positive side of such comparisons. The creator, expects each one to do what one is capable of, at any point at any time. He does not expect an ant to haul logs of timber as the elephant in a forest. The ant should not compare itself with an elephant and start complaining. There is an ancient Indian story about a mouse that was constantly distressed because it was afraid of cats. A magician took pity on it and turned it into a cat. Immediately, it started fearing dogs. The magician, therefore, turned it into a dog. Now the dog began to fear the tiger. So the magician turned it into a tiger. Right away, it began to fear the hunter. Finally, the magician was so disgusted that he turned the tiger back into a mouse and said, “You’ve got the heart of a mouse. That’s what you are and therefore you shall remain just that.” Hence we need to know what to look at and what to overlook. The issue isn’t whether we’ll compare ourselves with others – we will! – But to whom we compare ourselves is what matters. We should only compare ourselves with ourselves. If we do that, we can walk with joy and purpose through the mountains and valleys of life, without comparing ourselves to what others are doing, or how they’re doing it. Not only is that healthy, it is emotionally and spiritually liberating and energizing! Let me end this section on benchmarking with this real life story. In the 1976 Olympics, a runner from Haiti, competing in the 10,000 meter race, was lapped three times by the rest of the competitors. While many of us would have been happy to give up, he kept going. In fact, he ran three complete laps alone, dodging the men who were setting up the track for the next race. And when he finally crossed the finish line, he’d set a new personal best and a Haitian national record. We don’t need to concern ourselves as to where the others are. These are not our concerns. We only stop running when we have finished the race. Until then, we keep running the race set out before us. That way, when we cross the finish line, all encomiums will fall on us.